Nowadays, the vast majority of displays for desktop computers have 16:9 aspect ratio for various reasons (e.g., content, manufacturing aspects, etc.). However, there are a lot of professionals, who appreciate taller aspect ratios. 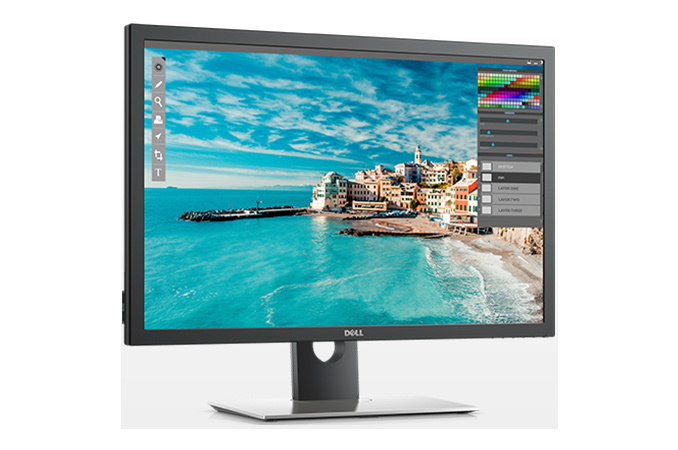 Specifically for such people Dell this week introduced the latest iteration of its venerable line of 30" 16:10 2560×1600 monitors, with the latest model covering all three color spaces important for digital content creators. 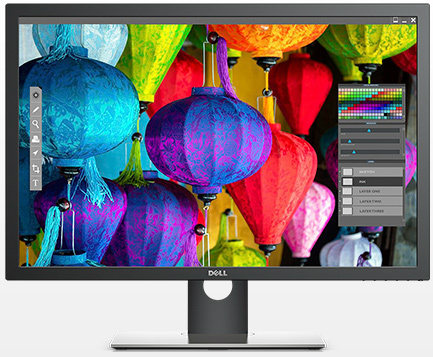 The Dell UltraSharp UP3017 is a 30-inch display featuring an IPS panel, which can reproduce 1.07 billion colors and covers 99% of the Adobe RGB, sRGB, and DCI-P3 color spaces. The sRGB and the DCI-P3 color spaces are particularly important for video editors and animation designers, who do post-production work. Moreover, the DCI-P3 color space is used for digital movie projection by the U.S. movie industry, an increasing amount of Apple mobile devices, and is expected to be eventually adopted in televisions and for home cinemas. And given the professional audience the UP3017 is intended for, it comes pre-calibrated, with users able to further calibrate it using Dell’s UltraSharp color calibration software and X-rite colorimeters. As for the other specifications, they do not differ too considerably from the UP3017's predecessor: a 2560×1600 resolution with a 60 Hz refresh rate, 350 nits typical brightness, 1000:1 static contrast, 6 ms response time in fast mode, W-LED backlighting (which a surprise for a display with a wide colour gamut) and 178° viewing angles. Do note however that unlike all of its 30” UltraSharp ancestors, the monitor has an adjustable stand that allows to rotate the panel clockwise or counter-clockwise to view the screen in portrait orientation. Since the UltraSharp UP3017 is a professional display, it comes with a greater than usual number of display inputs. Overall we're looking at two HDMI 1.4 inputs, one DisplayPort 1.2 input, and one mDP 1.2 input. Furthermore, the display has one DP 1.2 output with MST, to allow daisy-chaining another display off of it. Unlike the UltraSharp U3014, the monitor does not support DL DVI-D input, though this should not be an issue for owners of anything close to a modern PC. Meanwhile, like many high-end monitors, the monitor can be connected to two PCs with KVM, PBP and PiP features. In addition, the UltraSharp UP3017 has a quad-port USB 3.0 hub with two receptacles featuring BC1.2 charging capability. The UltraSharp UP3017 is already available directly from Dell for $1249.99. HDMI 1.4 can do 2560x1600x60Hz@10bit color. (Support was added in 1.3 actually). Mad props for pushing 16:10 monitor into the market!!! "Weak resolution and comical pricing" is this your weak attempt at being comical? Lots of older WQHD/WQXGA monitors have HDMI 1.3 or 1.4 ports but don't support that resolution over them. I'm not sure why that is. What's even more odd is my Dell U3011. For years I thought that DP and DL-DVI were the only way to get 2560x1600 on it but recently I upgraded my GPU to one that only has 1 DL-DVI port, and I have two monitors. So I switched my U3011 to DisplayPort. That worked great and all, but DP has this annoying property where if you turn the monitor off, it gets disconnected from the PC and rearranges all the windows. So I plugged the HDMI in and as I remembered it only let me select 1920x1200. I went into the NVIDIA control panel and created a custom resolution of 2560x1600 60Hz and CVT-RB. Lo and behold, it works! It seems like the monitor's EDID simply doesn't specify 2560x1600 as a supported resolution over HDMI, but if you send the signal anyways it works just fine. I won't even get started discussing the native Adaptive Sync technology DisplayPort offered all along over HDMI.